I got a question on twitter from @goryunov about how to do drill down reports. I plan on doing a few posts on reports since so much of the dialogs have changed. That make this the first of a few blogs on reports. Step 2. 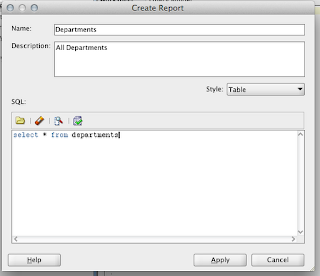 Create a "Departments" report by naming it and entering the SQL. This dialog has drastically changed from what was in the previous versions. More on that later. Step 3. Create a "Employees By Department" report. 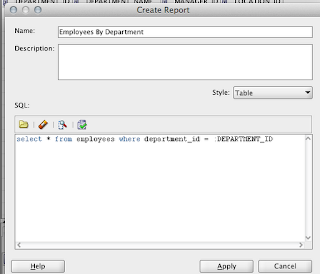 This report will use a bind variable from the Departments report which is the DEPARTMENT_ID column from the query. Step 4. Now edit the Departments report and choose the Drill Down item in the left options. Click "Add Report" This makes a new row in the table. The Name part is whatever name you like. The second will be a drop list of all reports in the tool. 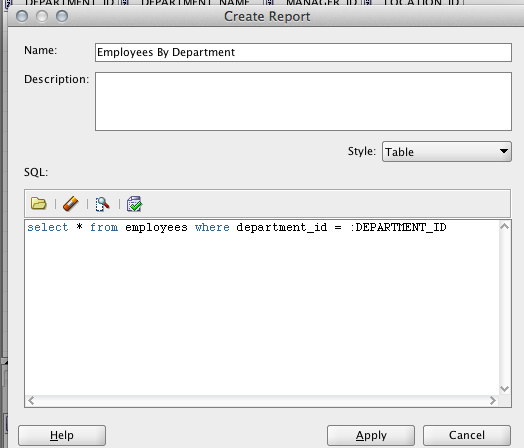 In this case, I scrolled down and choose my "Employees By Departments" report which is using the bind variable. Step 5. That's all there is to it. 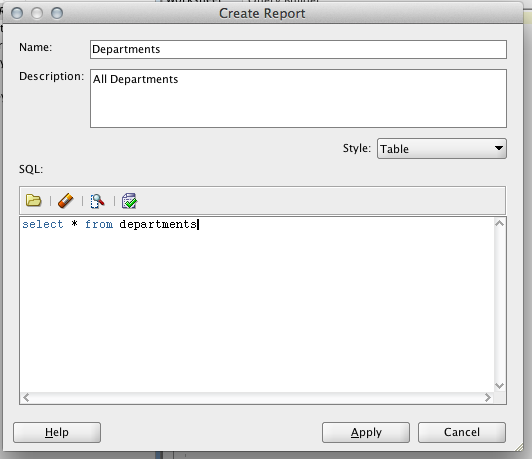 Now when I run the Departments report there's a new menu option for all drillable reports defined in Step 4. Step 6. When I choose that menu option, the values require are passed along.